From soaking up the sun on exotic beaches to enjoying winter wonderland scenery from a log cabin, there are many ways to celebrate the holidays. 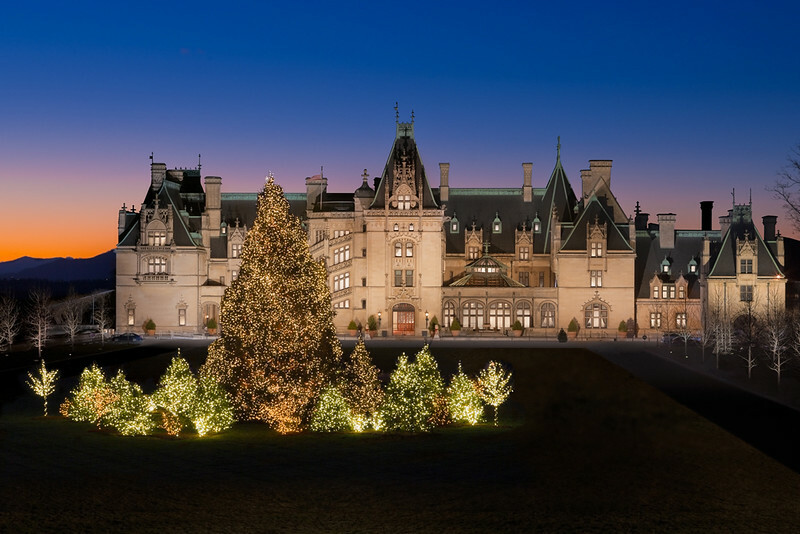 But, if you’re really looking to get into the holiday spirit, find a way to experience a Biltmore House Christmas at the Biltmore House Estate in Asheville, North Carolina. 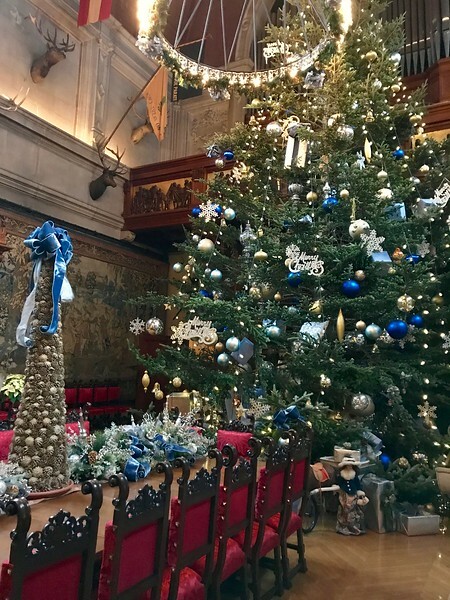 Regular contributor Debi Lander from ByLanderSea is here to share her experience visiting this unique southern landmark while it was decked out in all of its Christmas glory. This is a worthy addition to your bucket list travel experiences. Imagine it’s Christmas Eve 1895. George Vanderbilt welcomes his family and friends for the first time to his new home, the Biltmore in Asheville, North Carolina. Now, the Biltmore is not just an ordinary home or even lavish mansion, it is America’s largest private home with 175,000 square feet and 250 rooms. After six years of construction (with more to come), George adorned it with a 35-foot tree in the Banquet Hall and plenty of other decorations. Christmas Eve was quite a night in 1895. 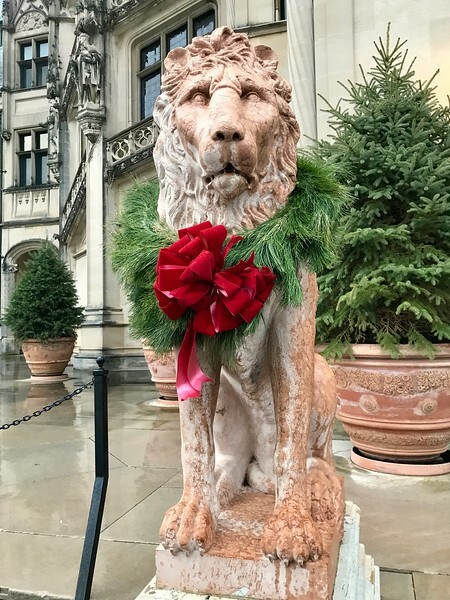 Today the extravagant holiday celebrations continue at the Biltmore—expanded to include 100 elaborate hand-decorated trees, 25,000+ ornaments, 1.5 miles of fresh garlands, 500 wreaths and sprays, 2,000 poinsettias,100 kissing balls and other holiday plants. And, of course, the traditional 35-ft. live Fraser fir in the Banquet Hall. Outside in the evening, see 300 hand-lit luminaries on Biltmore House’s Front Lawn and a lighted 55-foot Norway spruce draped with 45,000+ lights. After the NYC tycoon first visited the area, he fell in love with the surrounding Blue Ridge Mountains and clean air. His decision to build in Asheville brought prosperity to the entire region. The Biltmore stands as one of the must-see historic homes in America. Today, the estate covers something like 8,000 acres, and your first stop is the welcome center where you pick up tickets. Then, you drive to the parking lot and catch a shuttle bus to the main house. The decorations are simply stunning! The rambling exterior incorporates stone architecture resembling the chateaux in the Loire Valley of France. The carved stone figures on the exterior look like those found on Notre Dame Cathedral. Every detail held meaning for the owner, such as the intertwined initials GV on embossed copper flashing. The immense property and astonishing wealth will make you shake your head in disbelief. Every bit of the estate is covered in holiday cheer! The regal home shines this time of year. An audio guide, in my opinion, is necessary for touring the art-filled home, plus it’s fascinating. Vanderbilt hired architect Richard Morris Hunt and worked closely with him as they designed the blueprints. Note for grandparents: a kid’s audio guide is available with Cedric, the family’s Saint Bernard, as narrator, but I consider the house tour mainly for adults. Almost every room in the home has its own tree. Wear comfortable shoes and allow between one and a half to two hours, but don’t rush. Think of the place as a vast art museum with the personal touches of a scholarly multimillionaire: medieval tapestries, spectacular sculpture, detailed wood prints, exquisite paintings and fine furniture from world-class craftsmen. But, there’s also a priceless library with 10,000 rare volumes, a castle-like banquet hall with a 70-foot ceiling, 65 fireplaces and 43 bathrooms. 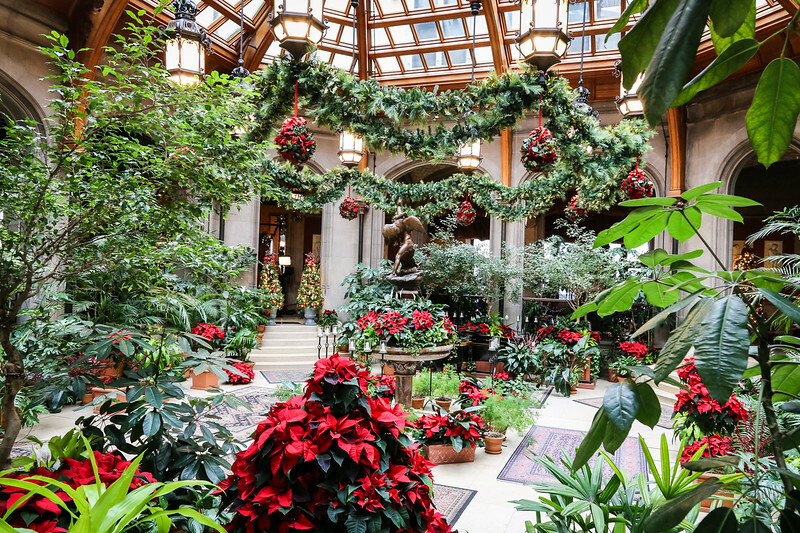 A trip to the Biltmore is just the thing to get you into the Christmas spirit! Touring at holiday time is an extra special delight. The decorations, themed for each room with color-coordinated ornaments and trim, glow like dazzling jewels. I especially enjoyed a dollhouse and antique toys resting beneath some of the trees. I found an elaborate nativity and a gingerbread replica of the mansion near the bakery in the basement. The solarium is magical. Even the local pets get the xmas treatment. 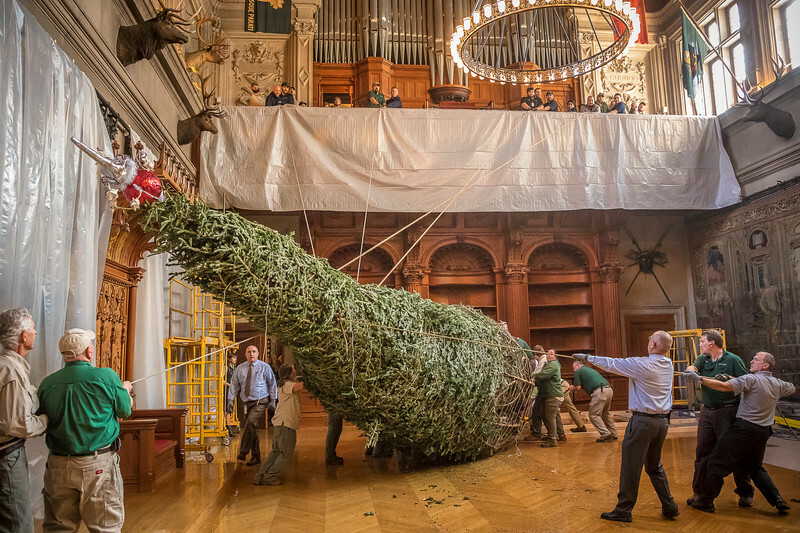 Here’s a bit of a Biltmore Estate Christmas insider secret—the giant fir tree is changed out mid-season. I suspect the team of elves must scurry to accomplish that magical task overnight. 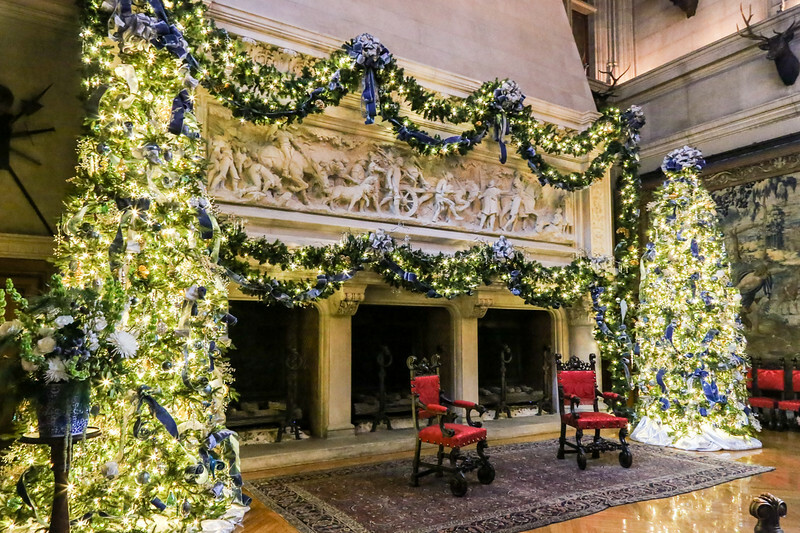 George Vanderbilt and his wife, Edith and their daughter, Cornelia, spent many Christmases together in Biltmore House, creating traditions that continue. 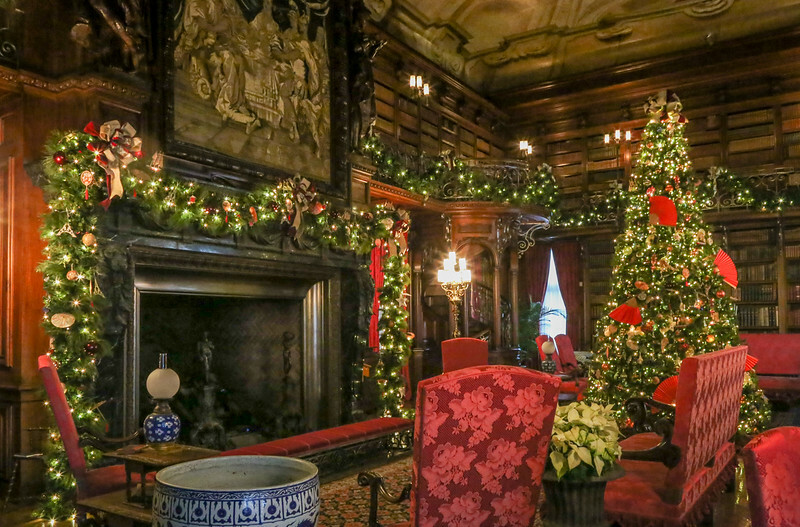 Mr. Vanderbilt’s descendants—the Cecil family, now the estate’s owners and caretakers—host the annual employee holiday party, just like the Vanderbilts did. The Cecil family makes sure each child of every estate employee receives a gift, a custom that Edith started when she was a young mother and hostess of Biltmore. Records show that Edith kept notes on what every child received each year to avoid repeating a gift in the years to follow. These lists exist, as well as receipts from FAO Schwarz detailing some of the toys and games she purchased. Now, on the day of the employee party, after the touring guests leave, a special events team fills the Winter Garden floor with 1,000+ wrapped gifts for the party. Santa and the Cecils hand them out to each child later that night. 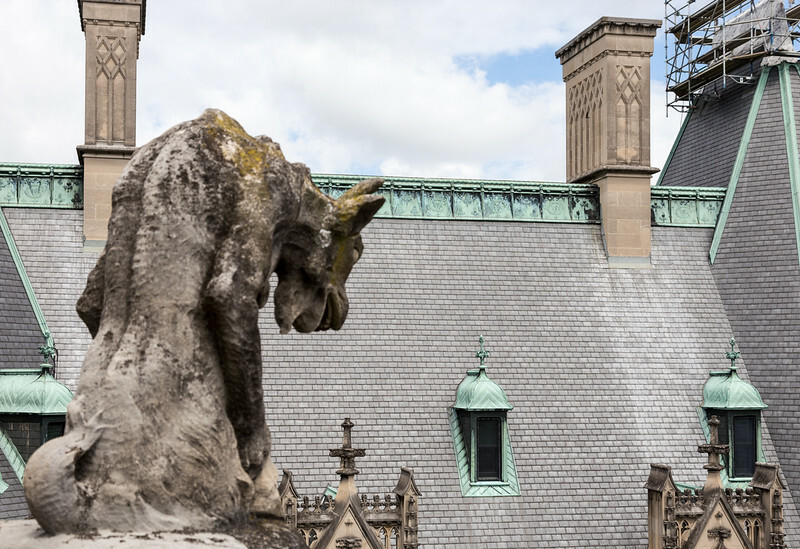 The rooftop tour lets you meet the Biltmore’s oldest residents, the Gargoyles. On a previous trip, I signed up for the behind the scenes Rooftop Tour that was led by a knowledgeable guide. The additional tour slips you through areas off-limits to regular visitors. You climb the spiral staircase in the Observatory to venture outside. The views from this height and the wrap-around balconies provide spectacular panoramic vistas of the property and mountains. No wonder George Vanderbilt was enamored with the area. My tour group inspected stone grotesques and gargoyles (stone figures that act as drain pipes) up close. “Pat the buttocks of the statue without a tail for good karma,” said my guide. So, naturally, I just had to give it a gentle tap! Can’t pass up a chance for good karma. You peek into the rafters and learn how the roof was designed to prevent snow from cascading down and damaging the glass solarium. Lastly, you stop at the spot George Vanderbilt liked to take his guests for sunset. This area shows off the skills of the architects, landscapers, stone carvers and other artisans who brought the project to fruition. I had to hurry through the colorful gardens planned by America’s foremost landscape architect, Frederick Law Olmsted—the man who designed Central Park in NYC. George Vanderbilt also studied horticulture and felt the gardens and forest were essential to the property. You can explore 2.5 miles of paths in the manicured gardens alone or stroll along the French Broad River if time permits. The extensive group of Biltmore gift shops sit near the main house. They are always worth a stop, but especially at Christmastime. I found a few unusual gifts for special people there. The Biltmore Winery, included with a house admission is another worthwhile inclusion. Read another take on a visit to Biltmore House, including the estate’s connection to the birth of forestry. You must drive to get to the winery, but don’t miss the fun and the bubbly in the tasting room. Plan ahead and book dates and times for both daytime and candlelight tours, since prime dates and times sellout in advance. Daytime tours are self-guided, but busier days will have timed entry to prevent overcrowding. Book ahead: Biltmore House Admission with self-guided audio tour and lunch. Includes a lowest price guarantee. Biltmore House takes on a warm glow during Candlelight Tours, complete with choirs and musicians performing. The front lawn glows with a 55-ft. Norway spruce with 45,000 lights and hundreds of hand-lit luminaries. Candlelight Evenings require a separate ticket for entry from daytime admission—and reservations are required. Included with the Candlelight ticket is a daytime visit on the same day or next day to explore the rest of the Estate. Since candlelight tickets are limited, many dates will sellout early. Buy tickets ASAP. 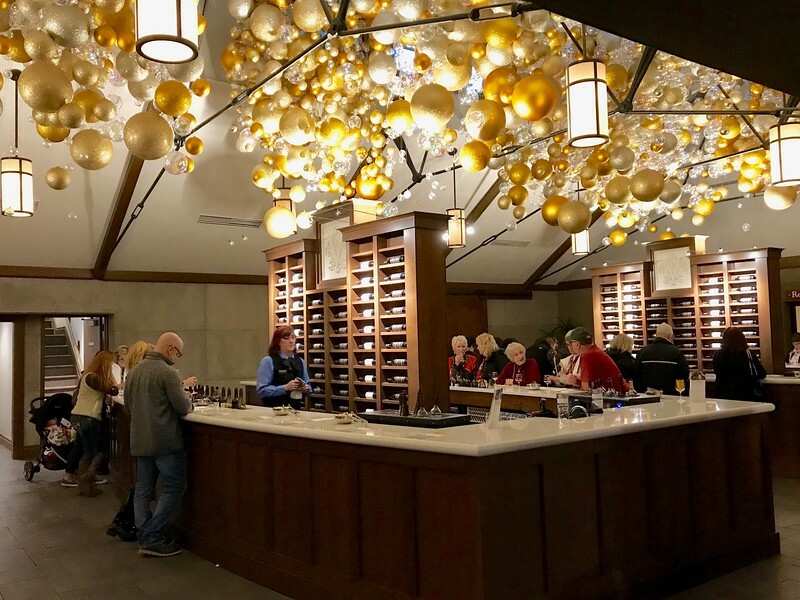 All tickets include self-guided tours of Biltmore House, the gardens, Antler Hill Village and the Winery (open until 8 p.m.) for a complimentary wine tasting. Don’t miss a trip to the tropics inside the Conservatory and strolling through the gardens with winter plantings. Buy daytime tickets at least 7 days in advance on the Biltmore Estate website and save $10 or more per ticket. Tour time reservations for house entry are required for many days, so plan ahead! Many days will sellout in advance. Seniors save $10 Tuesday & Wednesday at Ticket Center. And Military save $10 at Ticket Center. A variety of dining options lie near the winery at the Antler Hill Village. I chose Cedric’s Tavern for a tasty bite in a cozy atmosphere. Holiday Inn Suites Downtown Asheville: I stayed here on a previous visit and found the property excellent: ideally situated for downtown activities and less pricey than the Omni or Biltmore. A visit to the Omni Grove Park Inn itself is another sweet treat, an overnight stay even better. The 513-room resort recalls a grand old National Park lodge, decorated for the holidays with glorious greenery, trees and lights. 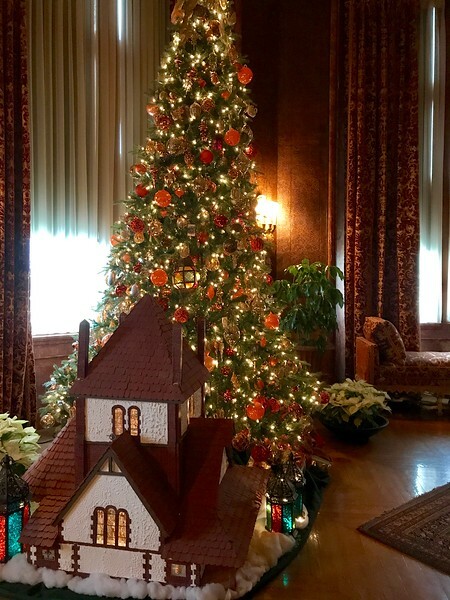 The Great Gingerbread House lures adults and kids alike to the welcoming Great Hall—a Hansel and Gretel 10 ½-foot gingerbread replica of the Inn. Children can buy hot cocoa as adults cozy up to the lobby bar. The Omni Grove Park Inn also has a reputation for being a great holiday destination. Yes, that’s gingerbread! This incredible entry by Billie Mochow Burn was placed in the Top 10 category in 2017. 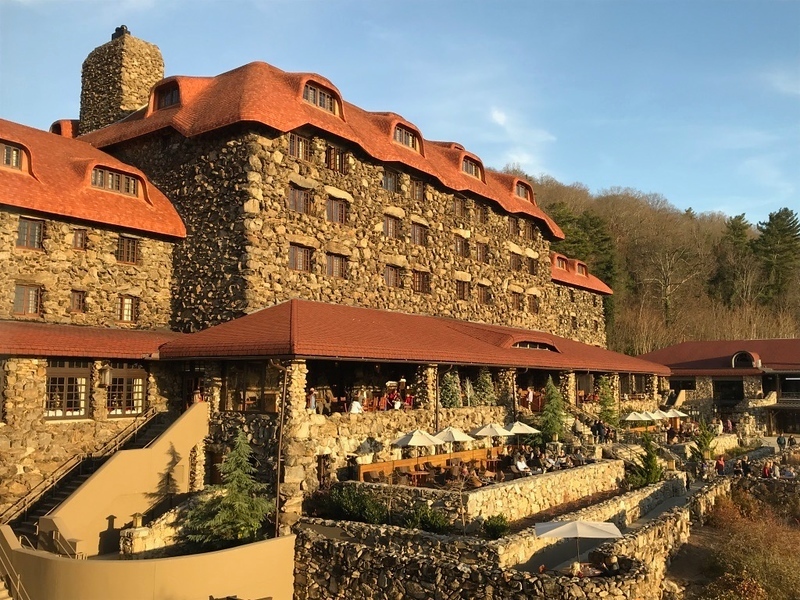 If you visit Asheville during holiday time, be sure to tour the winning entries from the National Gingerbread Competition, an event annually held before Thanksgiving at the Inn. Much more than elaborate houses and cutesy cakes, these creations are architectural masterpieces and stunning works of art. 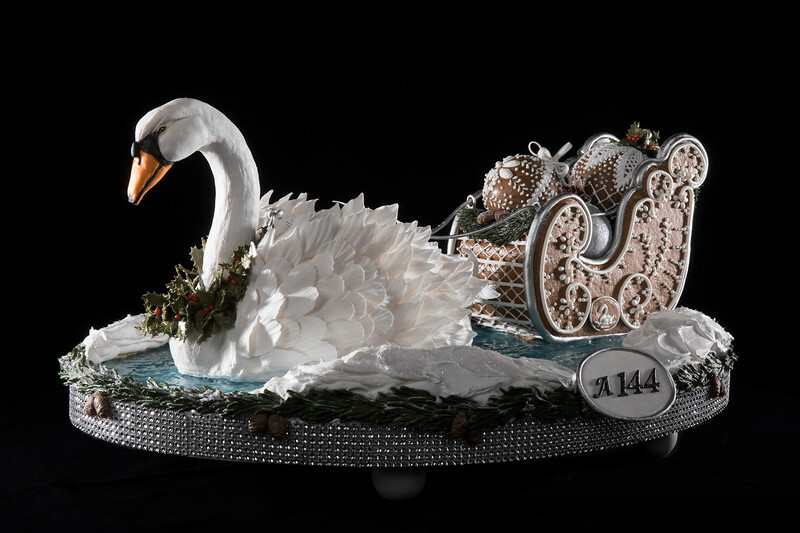 The contest takes gingerbread to the stratosphere of culinary design. The salt cave is certainly a unique place to visit. The fascinating Asheville Salt Cave is sustainable and growing! 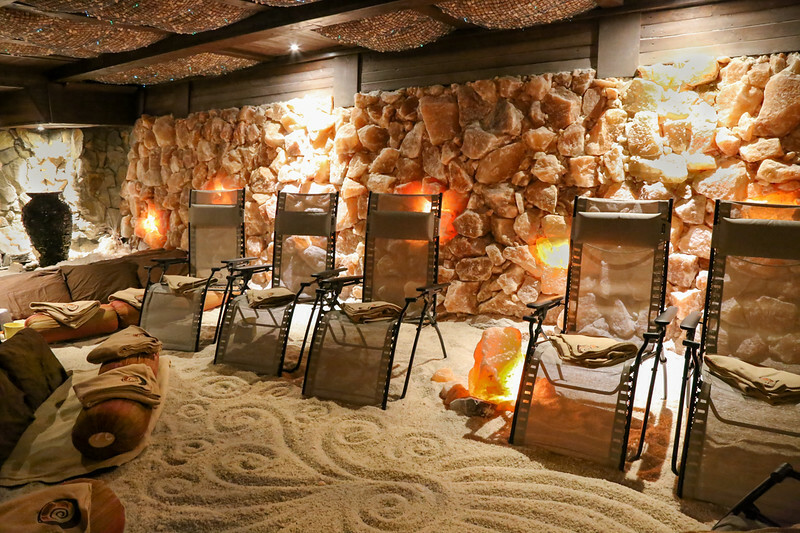 The air in the therapeutic salt cave is intensely saturated with negative ions, while the salt rock crystals in the cave release 84 trace elements and minerals that are essential for a healthy body. My session was relaxing and invigorating. I heartily encourage spending a few days in the mountainous Asheville area. Boomers will discover an array of activities from hiking, to biking and kayaking, to yoga, exploring museums, shopping, and dining on amazing culinary fare and spirits. Asheville is a happening crossroads where visitors and locals thrive on diversity and natural delights. 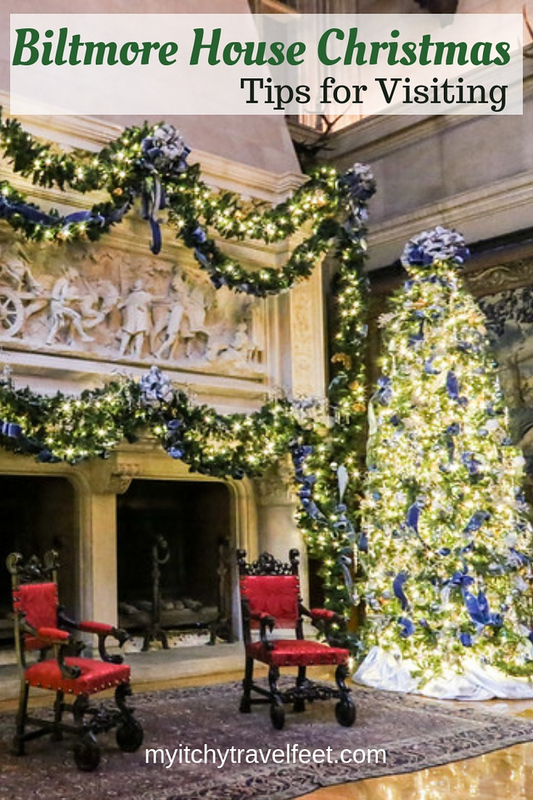 Would you like to celebrate Christmas at the Biltmore House? Come join the conversation at the My Itchy Travel Feet page on Facebook. Or send us an email with your thoughts.